The speed of your website is very important, not only for your Search Engine Optimisation (SEO) but also for your users sanity. Nobody wants to be hanging around to view your content. Page speed works on multiple levels. We all know Google likes fast pages but it also like websites that are browsed and engaged with. Fast page speeds will encourage a much better user experience that includes more page views and interaction. It’s a win win! This is the easy bit. Just head over to Google’s Page Speed Checker and enter your website address. You’ll end up with two reports, one for mobile and the other for desktop with a bunch of recommendations on how to speed things up. If it all looks a bit too technical then pass the information onto your web developer and get them working on speeding things up. There’s a lot of things that can really slow down a website and each site will be different but here’s a few common problem areas. I don’t mean large in physical size but in kilobyte/megabyte size. The trend in web design is to use really big images all over the place so we need to pick these carefully and compress them so they don’t take an age to download. 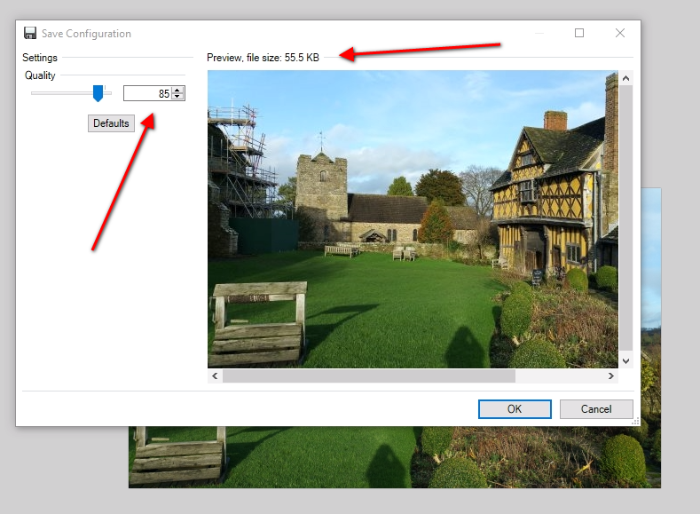 Use some image editing software to reduce the file size of your image. I use Paint.Net which is free but there are lots of other choices including Canva which is web based and does a really good job. The worst thing you can do is upload an image directly from your camera as it will be HUGE! This is another area that can really slow your website down. Spend some time editing your video’s down to a sensible length (no more than a minute for most videos) and upload them to YouTube, Facebook or Vimeo. The big reason for using these hosting services is that they provide copy & paste code to insert the video into your website but more importantly they optimise the streaming for mobile phones and don’t try and upload the whole video when the page first loads, only when the play button is clicked. This will really help to speed things up. Keep an eye on how many external widgets you display on each page as this can slow things down. Some widgets are quite clever and wait until your page has loaded its content before setting up the widget up but some aren’t so keep an eye on the load speed of things like embedded Twitter feeds, like & share buttons etc. If you find a third party service is starting to slow you down then find another solution, it’s not worth the hit on your page speed. You wouldn’t buy the cheapest and nastiest bricks, flooring, carpets and shelving for your real world store so don’t cheap out on website hosting for your online store. £1.99 a month hosting doesn’t cut it….. It really doesn’t! You don’t need to spend a fortune though. A £10 per month Virtual Private Server (VPS) may do the job for you and dedicated servers for small – medium sizes websites can only cost around £50 per month. It’s worth investing in some decent web hosting and if you don’t feel confident of managing a server yourself chat to your web developers and get them to look after it. If you use a Content Management System like WordPress then pretty much every time you load a page there will be lots of information dragged from the database. If you use low cost shared hosting there may be slow downs when connecting the website to the database. Have a word with your web developer to make sure everything is working efficiently and if not sort out some quality hosting. Dealing with the points above can make a huge difference in website performance but there are a few more techniques you can advantage of. This is the code that helps to make your website work but not all of it is essential. Things like social media share icons and tracking code doesn’t have to be loaded straight away. Ask your web developers to take a look at your website and move anything non-essential to the bottom of your website which will give your page a chance to load nice and quickly. This technique is useful if you have a large website with a lot of features. A must for all shopping carts! If you generate quite a bit of global traffic to your website it may be an idea to set up a CDN. The network will be made of of a bunch of servers in different locations around the world that store your web pages. This means that someone in the USA will grab pages from a server in the USA whilst someone in Japan gets the pages from their locality. If set up correctly this can seriously speed up your website so have a chat with some developers or take a browse at CloudFlare who offer a free plan for smaller websites. This popular Content Management System powers around 25% of the web and the W3 Total Cache Plugin can help to speed up your site. If you’re not technically minded then chat with your web developer to set it up, it can make a big difference. Website speed is important. Your visitors will thank you for a fast speed by engaging more with your business and hopefully buying more of your products and services. Make as many small changes as you can. Remember that six 0.25 second improvements means load speeds increase by 1.5 seconds. Feel free to leave your comments below or ask any questions on Twitter or Facebook.